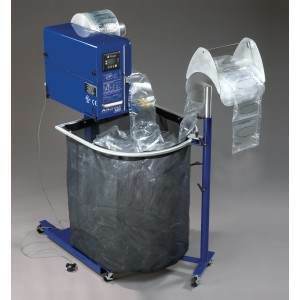 The AirSpeed 5000 system produces pillows on-demand for void-fill, cushioning and containment needs. only the amount they need for the application at hand. meeting customer needs, when and where they are required. Blazing speed 75 feet per minute; no need for bulky storage/dispensing systems. Portable No compressed air needed. Compact Easily fits into any packaging operation, large or small. Easy to operate Load film and start machine. Low maintenance Minimal wear items mean outstanding reliability. Versatile Single system produces inflated cushions of varying lengths and air fill levels, customized to fit your needs. Productive Integrate with an AirSpeed accessory for maximum productivity and ergonomics. Durability and air retention Excellent puncture resistance and sealability. Truth in sizing Pregis films yield 10  20% more void fill than competitive films due to minimum skirt loss. Transparent, clean and neat Improved customer satisfaction, cleaner than loose fill or kraft paper; customers can see the product packaged and avoids lost items or throwaways. Non-abrasive Soft, smooth film surface; eliminates paper cuts. 100% recyclable Recycling category #4. Sustainable film option Recycled content film available with a bio additive blend that accelerates biodegradation.